If you're really crafty, you can get people to do your work for you. Thus, my old cycling friend, Bill Pence, writes about a ride we did. I went out to amble around in the Fall City area to look for new roads for the Flock [this is a reference to the Goosebumps Rides, as in "flock" of geese]; I was joined by Steve and Agent Louise, who had finally escaped from the Space Aliens. She claimed to be in pitiful shape, but I saw no evidence to that effect. The anticipated sun had not yet arrived, in Fall City, so I was dressed with a winter jacket and gloves. Steve remarked that I was overdressed; it turns out that I was and I wasn't. He was under-dressed, part of the time. AL, who made no clothing changes and carried no jacket, seemed unaffected by the cold. Of course, this is a woman who regularly plunges into icy alpine lakes. Which says a lot for her constitution and not much for her common sense. We set off on David Powell road to warm up, a pleasant out and back. After the back, Steve led us up an old narrow footpath with vestigial asphalt which climbed steeply towards the Lake Alice road. There were downed trees and debris on the path so we sent Louise first [!]. We popped out on the Lake Alice road and climbed a very steep section. We were all pretty warm by now. 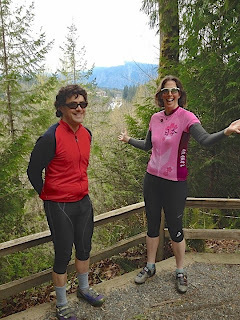 We found the Preston-Snoqualmie bike trail and followed it for 1.8 miles (flat) to the overlook (see photo below). Lovely bike path. Nice view of the Falls. The ideograms on Louise's jersey stand for "Beef with Broccoli" (front) and "Szechuan Family Dinner" (side) [little did Bill know, I was pre-ordering lunch]. Retracing our steps, we soon got quite cold, so it was back on with all of the clothing, except for Alpine Lakes in the pink. After some discussion, we determined that the rest of the trail, climbing up to Preston, was too steep and mossy for the Flock. So we headed down the Lake Alice road to Fall City. We went around the back of the town and took the Issaquah-Fall City road to the junction, then crossed the highway and headed for Carnation. Steve and AL wanted to do the climb! [he's BS-ing – Steve wanted to do the climb; I wanted to go pig out at Starbucks]. We turned back short of the bridge, as I needed to get back to work. We were forced to feed Louise to keep her going. A very nice ride. The sun came out just as we finished. Distance, about 26 miles. Conclusion: no really usable new roads up there for the Flock, but a nice way to spend the day. Steve and Louise kept me from slacking off. Agent Louise shows no apparent harm from her time with the Space Aliens, although she is planning her impending nuptials. Not sure if she met him on the spaceship. Steve and I were privileged to inspect The Rock. She promised not to appear on the TV show Bridezillas.